Over the past week I've caught myself trying to live out this whole "Love Without Agenda" thing. This past week I was troubled with myself when I did something that was "nice" but had an agenda behind it that benefited me. It ended up making me mad at myself instead. Long story but it's a weird feeling to catch yourself and try to break old habits. . . especially when you didn't know they were habits in the first place. A key phrase that stuck out to me when I was reading a few weeks ago was "muscle memory". I had it bookmarked but wasn't real sure how to use it. But it stood out to me and has been stuck in the back of my mind since then. Everyone has developed muscle memory. It's the old "practice makes perfect" mantra that we each play out in our everyday lives. (funny thought, if you practice something poorly it makes mediocre) From typing to driving to playing an instrument to brushing your teeth, we use it all the time. Has anyone ever caught themselves doing their routine in the wrong order? I've noticed a couple times in the past when I've had a fever or I had to get up at an ungodly hour (like 7!). I do things out of order, like wash my face before washing my hair in the shower or taking the road that goes to work when it's my day off. (of course I work from home now, so that can be awkward) Muscle memory keeps you doing the same things in the same order, day in and day out. When you somehow do something out of order you notice it. Cavemen. . . that's where we came from apparently. I've heard somewhere that (unfortunately Google can't seem to back me up on this, but) we developed our ability to judge situations from cavemen. 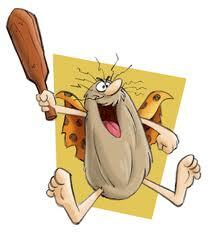 A caveman would have to make a snap judgment when he heard a rustle in the bush next to him or saw a shadow. Is it an animal trying to kill me or just the wind/light playing tricks on me? We developed this fight-or-flight instinct to keep us alive. We had to judge situations for our survival. . . makes sense. As we moved out of rock caves and moved into concrete caves in highrise buildings, our survival instinct stayed intact. But now instead of protecting ourselves from animals we're protecting ourselves from each other. Our survival instinct has stopped keeping us alive and started protecting our jobs, our stuff, our way of life, our pride, our thinking. . . our religion. So now instead of making judgments about shadows or rustling bushes we make judgments about people. Gay, black, white, Republican, Democrat, Arab, Christian, Muslim, poor, rich, divorced, single-mother, drunk -- just the words themselves put us into fight or flight mode! Have we trained ourselves to fight against "those people"? Is that guy with his boyfriend standing in front of you at Starbucks ordering a pumpkin-spice latte threatening you? Is that 17 year old girl pushing her stroller on the "wrong side of town" a threat? My guess is no. What about the guy at the polling station wearing his Obama or Romney hat proudly? That's a tough one, huh? Are they threatening your politics, your thinking, your pride. . . it's possible. Are your judgments towards them, either outwardly or inwardly, going to protect those things? Definitely not. Would a smile or a hello from you make their day and maybe change the way they think about "your kind"? Doesn't hurt to try! You see, they have muscle memory too. . . they make judgments about YOU. Maybe it's based on their past and maybe it's unwarranted, but YOU can start to change that. My challenge to myself (that I'm obviously extending to you) is to start breaking down my muscle memory when it comes to seeing people. To stop those knee-jerk reactions to people. Earlier I linked to an article that says if you practice something poorly it makes mediocre.We have muscle memories that are making us mediocre! It's amazing what you can see and who you can impact when you stop practicing poorly. Let's step up our game! 45 “He will reply, ‘Truly I tell you, whatever you did not do for one of the least of these, you did not do for me.'" Great blog and I plan on adding you to my favorites and following. But, I did not come from a caveman! God created man fully intelligent without evolution. He is amazing and did this all ing 6 days with a day to rest which set up our 7 day week right from the beginning of time. Evolution and caveman NOT!